Hollywood’s leading ladies are making a big play in this week’s real estate market, scooping up and selling notable properties from coast to coast. From Samantha Bee’s smart Manhattan Co-op, to Suzanna Somers’ reclusive canyon compound, check out the celebrity homes changing hands. 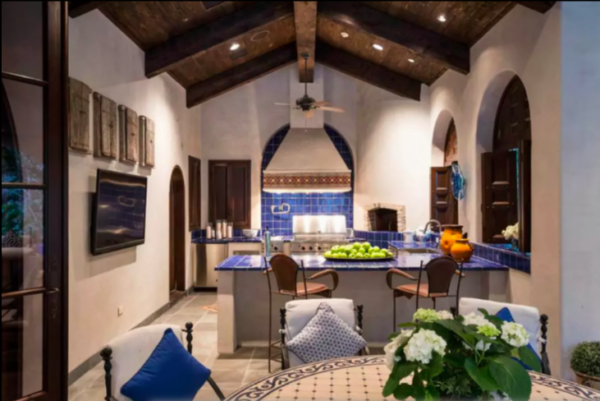 RENTED: Prior to leaping off the roof of Houston’s NRG Stadium and belting out Born This Way and Bad Romance on the Super Bowl’s halftime field, Lady Gaga kicked back at this beyond-luxurious Airbnb – fully pro bono. The glitter-encrusted chanteuse, like Mariah Carey and Chloe Grace Moretz before her, was put up free of charge by the short term rental company in this $20-milion Renaissance-style home that usually rents for $10,000 per night. We’re sure Gaga enjoyed her time on this gorgeous property, outfitted with a resort pool, chef’s kitchen, fitness centre, game room with bar, and plenty of chandeliers. BOUGHT: Samantha Bee, comedienne and host of political satire show Full Frontal, has scooped up a double-unit co-op on Manhattan’s Upper West Side for $3.7 million. And, with a total of four bedrooms and featuring a media room, fireplace, parquet floors, and stunning city views, it’s nothing to laugh at! FOR SALE: Yolanda Hadid, former star of the Real Housewives of Beverly Hills and mama to supermodels Gigi, Bella and Anwar, is moving to New York to be closer to her seriously good looking offspring. Her LA condo, located in the swanky Wiltshire Corridor neighbourhood, has hit the market for just under $5 million. Featuring a private elevator, fireplace, chef’s kichen with quartz counters, and a stunning master closet, this 3,950-square-foot unit is almost too beautiful to be real. FOR SALE: Actress Amy Smart and husband Carter Oosterhouse (host of HGTV shows Trading Spaces and Million-Dollar Rooms), are selling their mid-century Beverly Hills estate. With stunning details such as rock fireplaces, gleaming hardwood floors, chef’s kitchen, and massive yard with swimming pool, there’s lots to love about this gated, ranch-style home. FOR SALE: The star of Three’s Company has once again listed the massive Palm Springs property she has owned since the 70s, and which she has been trying to sell over the last seven years. A truly unique property spread over five buildings, the compound includes a structure dedicated to the master bed and bath, safe room, and offices, as well as enough space to host 32 for dinner. Just don’t expect any knocks on your door – sprawled over five different levels, much of this home is accessible only by funicular.